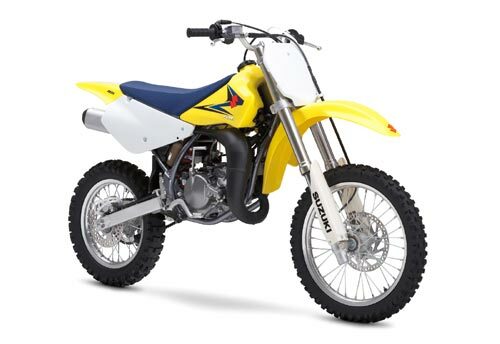 The RM85L and RM85 are loaded with technology derived from Suzuki’s championship-winning motocross bikes. Both bikes offer incredible performance with the RM85L featuring larger wheels and a longer swingarm and wheelbase to suit larger riders. Either way, with smooth power delivery, loads of mid-range and lightweight handling, both bikes are perfect for learning to race – and learning to win! Suspension Front Inverted, cartridge-type, 20-way adjustable compression & fully-adjustable rebound damping, 10.8 inches of travel. Suspension Rear Link-type, fully-adjustable spring preload, and 4-way compression and 16-way rebound damping, 10.9 inches of travel.